Jane had thought about a facelift for sometime. She had already visited 3 different plastic surgeons about this in the year before coming to see me, but had not felt ‘quite right’ about it. 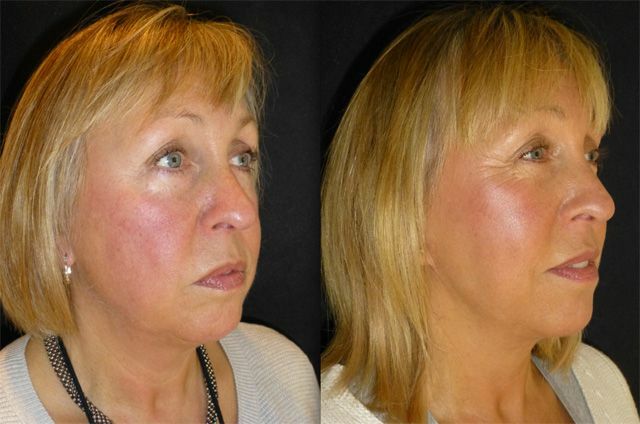 She was concerned about the long recovery and general anaesthetic associated with traditional techniques. We discussed her options with the aid of computer morphing software. 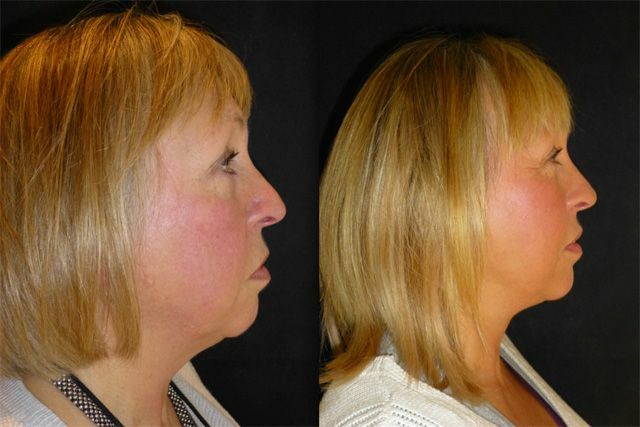 She desired a fresher appearance and a more sculptured profile. 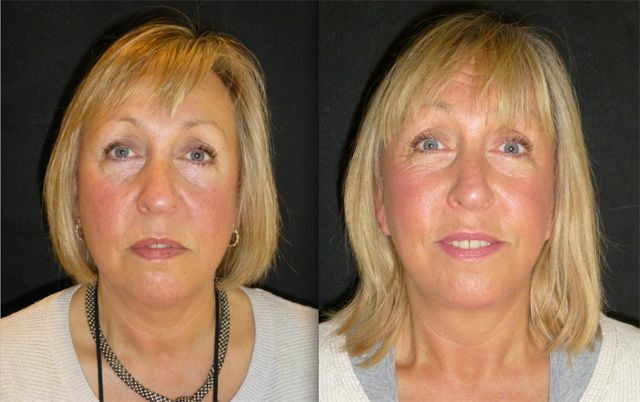 We decided to perform a full face and neck lift after liposuction to the under chin, jaw and jowl area. 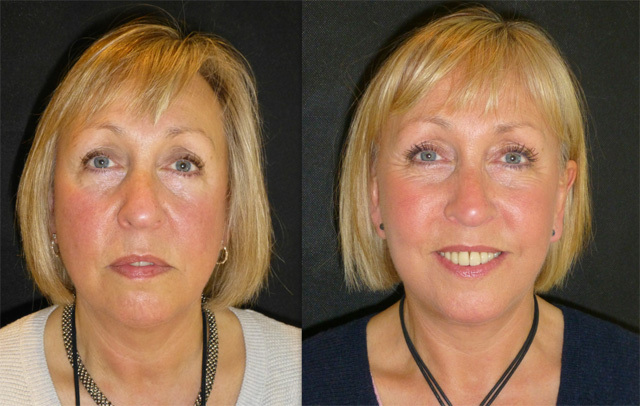 She also underwent brow lift, platysmaplasty , rhinoplasty and chin implant at the same time. 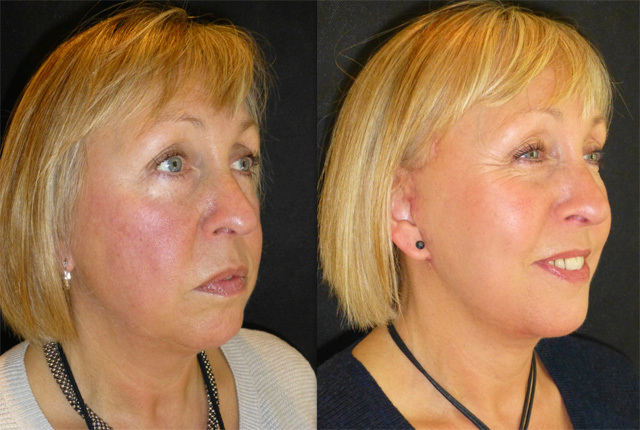 58 Year old lady for Extended Facelift and Necklift, Jaw and Jowl liposuction, platysmaplasty (submental tuck) and injection rhinoplasty. 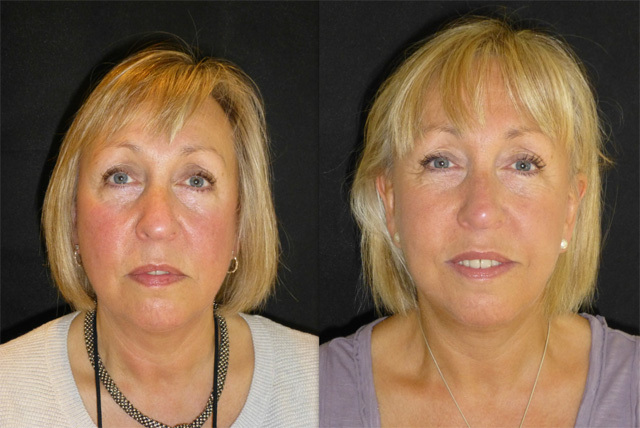 These photos are taken the morning after surgery which was performed under day case local anaesthetic and mild sedation. 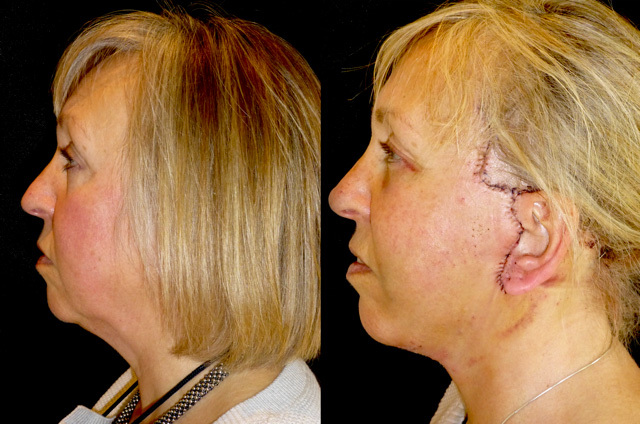 Jane was conscious and chatting throughout the procedure. 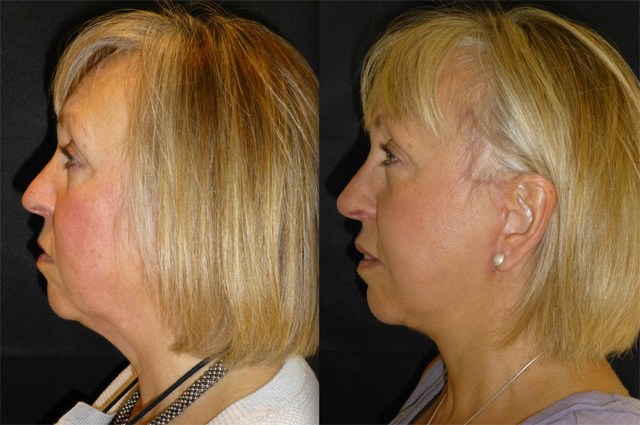 Note the immediate improvement in Neck contour, mid facial volume, jawline and jowls, midline neck and better nose projection. 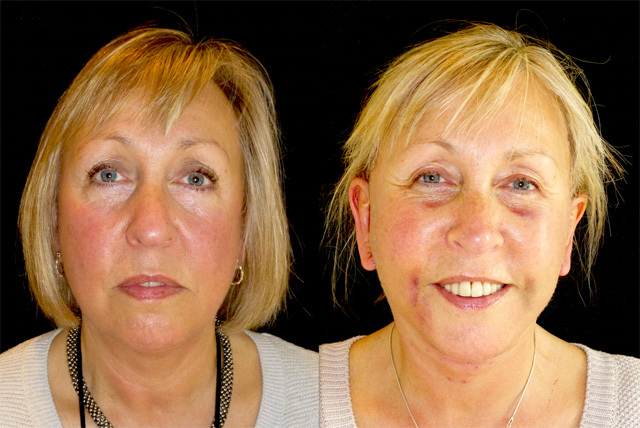 There is more swelling and bruising as expected with extended multiple procedures, but as with all our patients Jane arrived at 8am and was back home in her own bed by 3pm the same day. Jane is now 4 weeks following surgery. All the swelling has settled and the scars are softening and flattening. Her face looks less drawn and the volume has been put back where it belongs by her cheekbones! 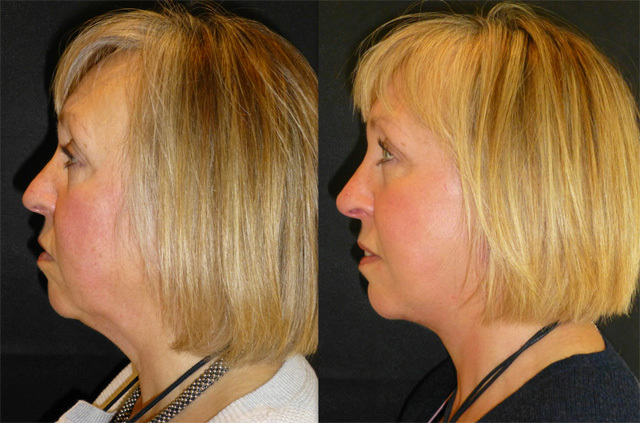 Her profile view is more refined, with a better projected nose and better defined jawline silhouette. 3 months following surgery and Jane has settled into her new face. Her scars are still a little red, which is unusual at this stage, but this is likely due to significant sun exposure without sunblock over the healing incision lines. Importantly they are flat and healing beautifully and the redness will fade with good sun exposure management and regular moisturisation. Jane is back for review. She looks fantastic. 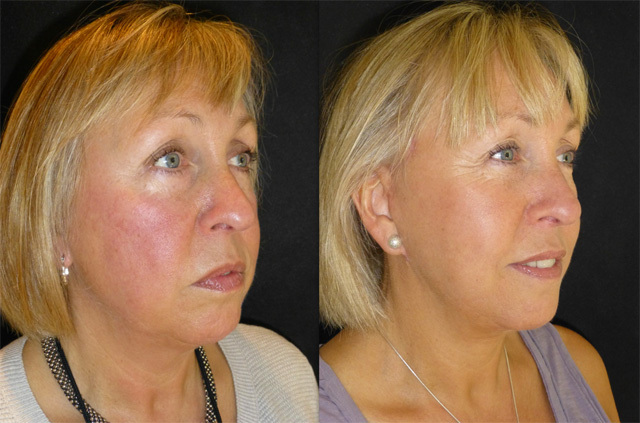 Her skin is hydrated and plump, her jowls have gone and her profile is refined after her injection rhinoplasty and chin implant. She has real balance to her face. 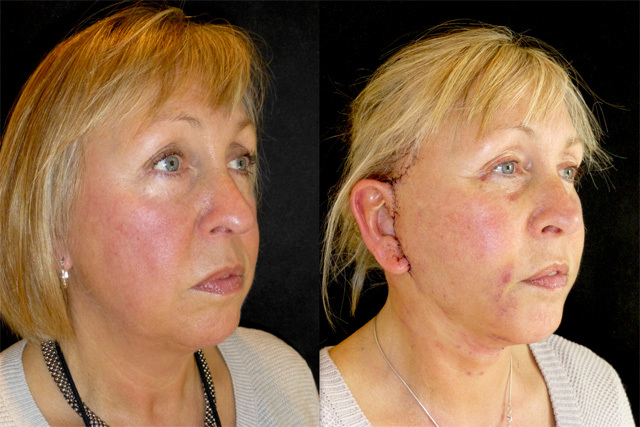 Careful use of 30+ SPF cream has helped her scars soften and contract and they are now barely noticeable.